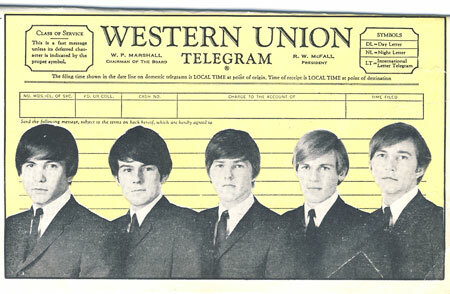 When The Five American’s released “Western Union” in the latter half of the 1960’s no one threw the record on the floor (to partially quote the song’s lyric). Much on the contrary, listeners scratched the infectious single on the record player. It received that many plays. The catchy tune about the delivery of some bad news by way of a Western Union telegram rocked the charts, reaching the sixth spot on Billboard (three in Cashbox) and selling in excess of one million records. It was the band’s biggest hit, and the product of some years of hard work. As you can see, unfortunately three members of the band have passed away recently. The band split in 1969, and the members went on to other professions (teacher, minister, photographer). Jim Grant actually became a logo designer and one of his designs is the Chili’s restaurant logo. Who knew? Well, now you do! John Durrill was hired as the organ player for The Ventures and he became a songwriter. Mike Rabon initially continued with music and had a succesful touring band, Michael Rabon And Choctaw, in the 70s. The Five Americans did release other material before “Western Union”. In fact, their 1965 song, “I See The Light” hit 26th spot on the Billboard charts. However, the band will be most known for their ode to Western Union, a song that is still played today (5,000 times per month in the US and Canada, according to the band’s website), and I know it is played almost daily on the Sirius 60s on Six radio station. It’s not like anyone will complain. It is an excellent song. It is just so damn catchy. The small guitar hook and sticky harmonies. The brief falsetto followed by the repetition of “dit, dit, dit,” just flies around your head. You must give the Five Americans some credit for creating a pop smash with such staying power. I think its important, though, to also look into the piece. When you get deeper into the song you can hear some neat keyboard riffs and a very capable rhythm section holding the song together. It’s a great song and will always be associated with big hits of the 1960s. Mike Rabon released a memoir entitled “High Strung” which is available on the band’s website. With purchase of the book, you can receive a copy of the CD.